52 Traditional Tunes from Fiddle Hell: Played Fast & Slow, Volume 2. 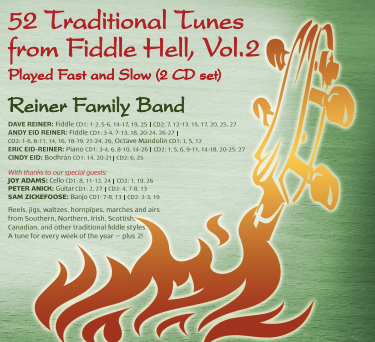 This 2-CD set has all of the New 52 tunes on it, as recorded in both fast and slow versions by the Reiner Family Band and friends. The tunes are described here. It’s just $15 for the 2-CD set, including shipping within the continental US. Price: $15 includes shipping (within the continental US) for the 2-CD set. A tune for every week of the year! Each of the new 52 tunes from the Fiddle Hell Common Tune List is played both up-to-tempo and slowly. Includes reels, jigs, waltzes, hornpipes and airs from Southern, Northern, Irish, Scottish, Canadian, and other traditional fiddle styles. This will help you prepare for Fiddle Hell, or learn the tunes even if you can't make it this year. Order a copy for yourself and for a friend or family member, and you can learn the same tunes to play next time you're together. Price:$15 includes shipping (within the continental US) for the 2-CD set. A tune for every week of the year! Each tune from the Fiddle Hell Common Tune List is played both up-to-tempo and slowly. Includes reels, jigs, waltzes, hornpipes and airs from Southern, Northern, Irish, Scottish, Canadian, and other traditional fiddle styles. Here's an online review of the CDs. Digital MP3 downloads are available at CDBaby for $11.99 (or $0.99 per track). CDBaby can also handle international shipping of the CD. 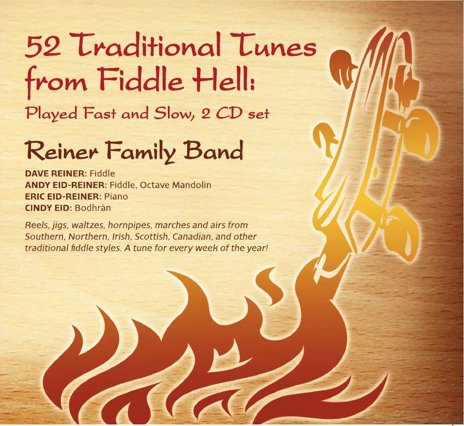 CD: Reiner Family Band Live! 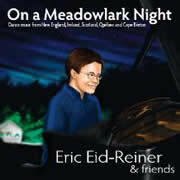 Recorded live at Codman Farms, Lincoln, MA, this CD sounds just like us! 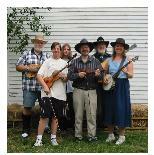 Bluegrass, oldtime, Irish, swing, and more. Guaranteed to get your toes tapping! A critically acclaimed book covering oldtime, bluegrass, Irish, blues, Scandinavian, Cajun, Texas, swing and jazz, and twin fiddling styles. This book also covers bowing patterns, careful explanations of chords and chord progressions, kickoffs and endings for fiddle tunes, and improvisation. Contains 10 of the tunes on the Fiddle Hell common tune list, and 6 tunes writen out for twin fiddle! 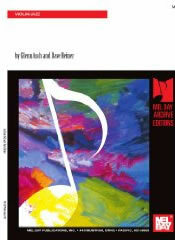 The companion CD features David Reiner's performance of all the tunes in the book. Review from Celtic Beat (October 2010): Incredible versatility might be the word for lack of another for the pianist ofMatching Orange-the new “kids on the block” in Contra Dance. This CD is massive and if you like a wide combination of musical style combined with superb craftsmanship on the keys this is one you should have. Created with fellow artists, such as family members Andy and Dave Reiner, dulcimerist Ken Kolodner, fiddler Kimberly Fraser, flautist Anna Grosslein,and featuring modern pieces by Dave Richardson, Keith Murphy and Jeremiah McLane as well as time honored traditional pieces the springboard for this album were the sessions at the Meadowlark Music Camp. For sheer poetry, sad and powerful is “Neil Gow’s Lamentation On The Death Of His Second Wife” (11) Right here is proof that for artistry you don’t need a symphony orchestra. I have heard weaker renditions of this, and equal, but never stronger. There is a wonderful playing of Dave Richardson’s “Calliope House” combined with “Andy DeJarlis” (6) This illustrates a rule for this album: that the tunes here are rightly combined together, and still manage to be ear catching and exciting. Everything in balance. Eric plays a variety of great tunes and medleys on piano, in styles ranging from Cape Breton, Irish, Norwegian and oldtime to ragtime, jazz, Jewish and modern folk. Dave and Andy join in on fiddle, including several twin fiddle tunes. Don't miss Eric's original composition, The Fiddle Bottle Waltz. 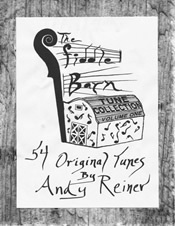 The Fiddle Barn Tune Collection - Volume One: 54 Original Tunes By Andy Reiner. As Andy writes in the introduction: "The nature of traditional fiddle music is malleable. Newly composed tunes mingle with old tunes in jams, parties, concerts, and in today's age, recordings. Through the ears and hands of many fiddle players, a new tune may become part of the tradition. Tunes that were new 200 years ago are deemed traditional now." Don't miss Cape Breton Jellyfish, Blue Sky Basin, Loonacy, Transylvanian Waltz, Brian the Seagull, The Kelp Dance, Lemon of Reality, and 47 more great new tunes! Just re-published as an archive edition, with free mp3’s online, this classic book covers many styles and well-known players, with tunes, exercises, history, and photos. Tunes in the styles of Darol Anger, Svend Asmussen, Vassar Clements, Stéphane Grappelli, Mark O'Connor, Jean-Luc Ponty, Stuff Smith, Eddie South, Benny Thomasson, and Joe Venuti. The melodies are not direct transcriptions of the artists' playing, but rather original tunes and improvisations such as Lunar Dog, Timescape, and Mango Swing that Dave and Glenn (and other jazz violinists) have written in their styles. Many hours of careful listening have gone into identifying the characteristic approach, favorite licks and techniques, and overall interpretive framework of each violinist. 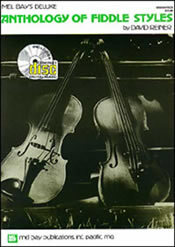 Includes sections on scales, chords, progressions such as ii-V-I and ii-bII7-I, altered notes, turnarounds, improvising, bow techniques, and rhythm patterns. The evocative sounds of Bronwyn's nyckelharpa and Mariel's hardanger fiddle combine with the fiery tone of Andy's fiddle and the driving force of Stash's guitar to brew up a tasty mix of traditional music infused with startling rhythms and innovative arrangements. Four great tunes on this debut CD. 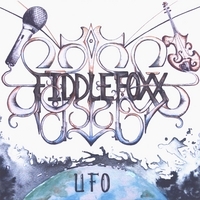 The hybrid of new original fiddle music, hip hop beats, tight harmonies and deep grooves, FiddleFoxx pays respects to traditional world music as they break down stylistic and cultural barriers. Andy Reiner's on fiddle and mandolin and vocals, with Steve Foxx on beatbox and vocals, Stash Wyslouch on guitar and vocals, and Evan Marien on bass. Groove fiddler Andy Reiner and Steve Foxx the Beatbox are FiddleFoxx. All original psychedelic hip-hop folk. 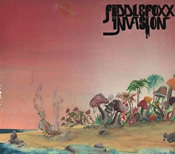 Great music from the fiddle beatbox revolution!